In Effective Java (Second Edition, item 15), Josh Bloch mentions that he is of the opinion that Java programmers should have the default mindset that their objects should be immutable, and that mutability should be used only when strictly necessary. The reason for this post is it seems to me that most Java code I read doesn’t follow this advice, and I have come to the conclusion that immutability is an amazing concept. My theory is that one of the reasons why immutability isn’t as widely used as it should be is that as programmers or architects, we usually want to open up possibilities: a flexible architecture allows for future growth and changes and gives as much freedom as possible to solve coding problems in the most suitable way. Immutability seems to go against that desire for flexibility in that it takes an option away: if your architecture involves immutable objects, you’ve reduced your freedom because those objects can’t change any longer. How can that be good? The two main motivations for using immutability according to Effective Java is that a) it is easier to share immutable objects between threads and b) immutable objects are fundamentally simple because they cannot change states once instantiated. The former seems to be the most commonly repeated argument in favour of using immutable objects – I think probably because it is far more concrete: make objects immutable and they can easily be shared by threads. The latter, that the immutable objects are fundamentally simple, is the more powerful (or at least more ubiquitous) reason in my opinion, but the argument is harder to make. After all, there’s nothing you can do with an immutable object that you cannot also do with a mutable one, so why constrain your freedom? I hope to illustrate a couple of ways that you both open up macro-level architectural options and improve your code on the micro level by removing your ability to modify things. First, I would like to spend some time on the concurrency argument and look at it from a more general perspective than just Java. Let’s take something that is familiar to anybody who has worked on a distributed system: caching. A cache is a (more) local copy of something where the master copy is for some reason expensive to fetch. Caching is extremely powerful and it is used literally everywhere in computing. The fact that the item in the cache could be different to the master copy, due to either one of them having changed, leads to a lot of problems that need solving. So there are algorithms like read-through, refresh-ahead, write-through, write-behind, and so on, that deal with the problem that the data in your cache or caches may be outdated or in a ‘future state’ when compared to the master copy. These problems are well-studied and solved, but even so, having to deal with stale data in caches adds complexity to any system that has to deal with it. With immutable objects, these problems just vanish. If you have a copy of a certain object, it is guaranteed to be the current one, because the object never changes. That is extremely powerful in designing a distributed architecture. I wonder if I can write a blog post that doesn’t mention Git – apparently not this one at least :). Git is a marvellous example of a distributed architecture whose power comes to a large degree from reducing mutability. Most of the entities in Git are immutable: commits, trees and blobs and all of them are referenced via keys that are SHA-1 hashes of their contents. If a blob (a file) changes, a new entity in Git is created with a new hash code. If a tree (a directory – essentially a list of hash codes and names that identify trees or blobs that live underneath it) changes through a file being added, removed or modified, a new tree entity with new contents and a new hash code is created. And whenever some changes are committed to a Git repository, a commit entity (with a reference to the new top tree entity and some metadata about who and when made the commit, a pointer to the previous commit/s, etc) that describes the change set is created. Since the reference to each object is uniquely defined by its content, two identical objects that are created separately will always have the same key. 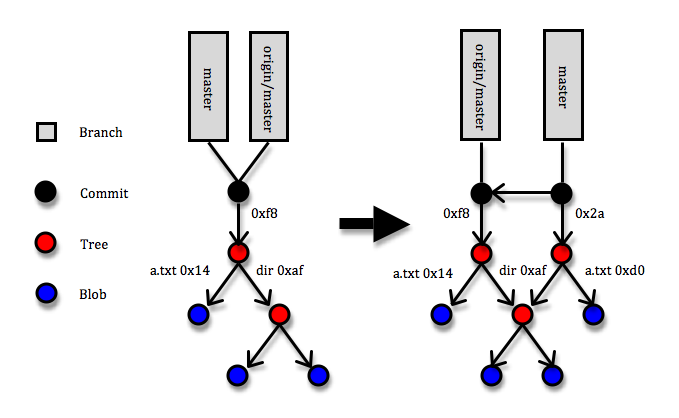 (If you want to learn more about Git internals, here is a great though not free explanation.) So what makes that brilliant? The answer is that the immutability of objects means your copy is guaranteed to be correct and SHA-1 object references means that identical objects are guaranteed to have identical references and speeds up identity checks – since collisions are extremely unlikely, identical references is the same as objects being identical. Suppose somebody makes a commit that includes a blob (file) with hash code 14 and you fetch the commit to your local Git repository, and suppose further that a blob with hash code 14 is already in your repository. When Git fetches the commit, it’ll come to the tree that references blob 14 and simply note that “I’ve already got blob 14, so no need to fetch it”. The diagram above shows a simplified picture of a Git repository where a commit is added. The root of the repository is a folder with a file called ‘a.txt’ and a directory called ‘dir’. Under the directory there’s a couple more files. In the commit, the a.txt file is changed. This means that three new entities are created: the new version of a.txt (hash code 0xd0), the new version of the root directory (hash code 0x2a), and the commit itself. Note that the new root directory still points to the old version of the ‘dir’ directory and that none of the objects that describe the previous version of the root directory are affect in any way. That Git uses immutable objects in combination with references derivable from the content of objects is what opens up possibilities for being very efficient in terms of networking (only transferring necessary objects), local space storage (storing identical objects only once), comparisons and merges (when you reach a point where two trees point to the same object, you stop), etc., etc. Note that this usage of immutable objects is quite different from the one you read about in books like Effective Java and Java Concurrency in Practice – in those books, you can easily get the impression that immutability is something that requires taking some pretty special measures with regard to how you specify your classes, inheritance and constructors. I’d say that is only a part of the truth: if you do take those special measures in your Java code, you’ll get the benefit of some specific guarantees made by the Java Memory Model that will ensure you can safely share your immutable objects between threads inside a JVM. But even without solid guarantees about immutability like the JVM can provide, using immutability can provide huge architectural gains. So while Git doesn’t have any means of enforcing strict immutability – I can just edit the contents of something stored under .git/objects, with probable chaos ensuing – utilising it opens up for a very powerful architecture. When you’re writing multi-threaded Java programs, use the strong guarantees you can get from defining your Java classes correctly, but don’t be afraid to make immutability a core architectural idea even if there is no way to actually formally enforce it. I guess the clearest point I can make about immutability, like most of the others who have written about it, is still one about concurrent execution. But I am a believer also in the second point about the simplicity that immutability gives you even if your system isn’t distributed. For me, the essence of that point is that you can disregard any immutable object as a source of weirdness when you’re trying to figure out how the code in front of you is working. Once you have confirmed to yourself that an immutable object is being instantiated correctly, it is guaranteed to remain correct for the rest of the logical flow you’re looking at. You can filter out that object and focus your valuable brainpower on other things. As a former chess player, I see a strong analogy: once you’ve played a bit, you stop seeing three pawns, a rook and a king, you see a king-side castle formation. This is a single unit that you know how it interacts with the rest of the pieces on the board. This allows you to simplify your mental model of the board, reducing clutter and giving you a clearer picture of the essentials. A mutable object resists simplification, so you’ll constantly need to be alert to something that might change it and affect the logic. On top of the simplicity that the classes themselves gain, by making them immutable, you can communicate your intent as a designer clearly: “this object is read-only, and if you believe you want to change it in order to make some modification to the functionality of this code, you’ve either not yet understood how the design fits together or requirements have changed to such an extent that the design doesn’t support them any longer”. Immutable objects make for extremely solid and easily understood building blocks and give the readers clear signals about their intended usage. There are very few things that are all beneficial, and this is of course the case with immutability. So what are the problems you run into with immutability? Well, first of all, no system is interesting without mutable state, so you’ll need at least some objects that are mutable – in Git, branches are a prime example of mutable object, and hence also the one source of conflicts between different repositories. A branch is simply a pointer to the latest commit on that branch, and when you create new commits on a branch, the pointer is updated. 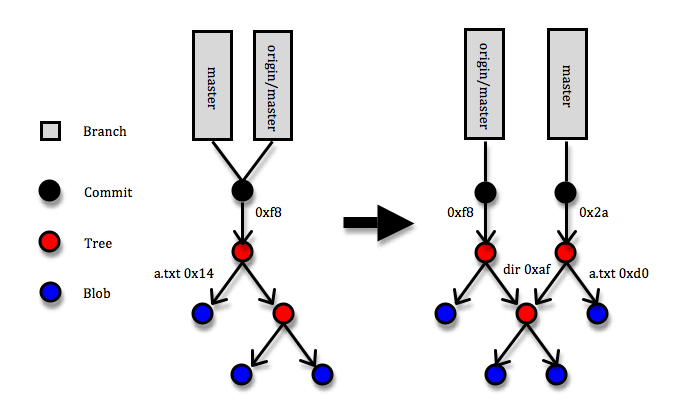 In the diagram above, that is reflected by the ‘master’ label having moved to point to the latest commit, but the local copy of where ‘origin/master’ is pointing is unchanged and will remain so until the next push or fetch happens. In the mean time, the actual branch on the origin repository may have changed, so Git needs to handle possible conflicts there. So the branches suffer from the normal cache-related staleness and concurrent update problems, but thanks to most entities being immutable, these problems are confined to a small section of the system. Another thing you’ll need, which is provided for free by a JVM but not in systems in general, is garbage collection. You’ll keep creating new objects instead of changing the existing ones, and for most kinds of systems, that means you’ll want to get rid of the outdated stuff. Most of the times, that stuff will simply sit on some disk somewhere, and disk space is cheap which means you don’t need to get super-sophisticated with your garbage collection algorithms. In general, the memory allocation and garbage collection overhead that you incur from creating new objects instead of updating existing ones is much less of a problem than it seems at first glance. I’ve personally run into one case where it was clearly impossible to make objects immutable: in Ardor3D, an open-source Java 3D engine, where the most commonly used class is Vector3, a vector of three doubles. This feels like it is a great candidate for being immutable since it is a typical small, simple value object. However, the main task of a 3D engine is to update many thousands of positions of things at least 50 times per second, so in this case, immutability would be completely impossible. Our solution there was to signal ‘immutability intent’ by having the Vector3 class (and some similar classes) implement a ReadOnlyVector3 interface and use that interface when some class needed a vector but wasn’t planning on modifying it. There’s a lot more solid but semi-concrete advice about why immutability is useful outside of the context of sharing state between threads in Effective Java, so if you’re not convinced about it yet, I would urge you to re-read item 15. Or maybe the whole book, since everything Josh Bloch says is fantastic. To me, the use of immutability in Git shows that removing some aspects of freedom can unlock opportunities in other parts of the system. I also think that you should do everything you can do that will make your code easier for the reader to understand. Reducing mutability can have a game-changing impact on the macro level of your system, and it is guaranteed to help remove mental clutter and thereby improve your code on the micro level. This entry was posted on May 4, 2010, 17:16 and is filed under Java, Software Development. You can follow any responses to this entry through RSS 2.0. You can leave a response, or trackback from your own site.